Well that went pretty much how I expected. The Seahawks starters got off to a very slow start and although we put up 20 points, we were unable to complete the comeback. The Denver Broncos defeated the Seahawks 22-20 Friday night in our preseason opener. As bad as our starters may have played, there were some positives that should be taken out of this game. Here are some brief thoughts. So Rusty: I predicted that the Seahawks starting offense would be so rusty they would not be able to score any points. Fortunately were able to put up a field goal, but that did not make the performance of Russell Wilson any better. Wilson completed the only pass he attempted, a 12-yard play action pass to Jimmy Graham. What detracted from Wilson’s effectiveness however was his inability to get a clean pocket. The starting offensive line was porous, and Wilson was sacked twice rather easily. Even Marshawn Lynch would have had trouble gaining yards behind tonight’s line if he had played. Next week in Kansas City it should be an expectation that the Seahawks starters can put together a decent drive and be in position to score at least one touchdown. If they cannot rebound and show improvements from this week to next I am absolutely going to start to worry. Lockett Worth the Trade: We traded three picks to move up in this year’s draft to select Tyler Lockett and boy is that looking like a great decision or what? Lockett was the star of the game, racking up 186 return yards including a 103-yard return for a touchdown in the second quarter. Since I have not been to a training camp practice yet this season I have not been able to see Lockett’s speed first hand. I was blown away on Friday night. I believe Lockett has already earned the kick returner job and could make Paul Richardson’s role on this team obsolete. I do not want to compare Lockett to Percy Harvin, all I will say in that regard however is that I like what I have seen so far. Clark, Rawls Earn a Leg Up: Defensive end Frank Clark made a big impact in the second half of Friday’s game. 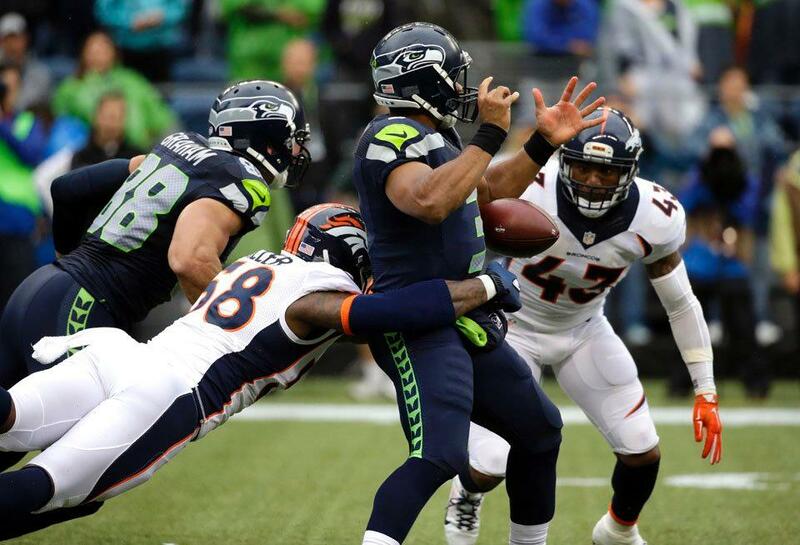 Clark led all Seahawks defenders in tackles with 9 including a huge stop on a 3rd and 1 opportunity for the Broncos. He did not make a huge impact rushing the passer but I expect that to change in the coming weeks. On a night where the offense was rather putrid, running back Thomas Rawls was one bright spot. Rawls carried the ball 9 times for 31 yards. He also caught a 19-yard touchdown pass out of the backfield. Rawls has very quick feet and his speed makes him a legitimate threat on the ground. If Rawls continues to impress, it is a very real possibility that either Robert Turbin or Christine Michael may be out of a job by the end of the preseason. Huge Load of Laundry: Penalties always seem to be a problem for the Seahawks, even more so during the preseason. Tonight Seattle committed 10 penalties for 71 yards. This must improve next week. I believe an acceptable number of penalties should be about 5. We must see improvement in this department next week. Random Thoughts: The new 12 flag ceremony is awesome. With the new Toyota Fan Deck in the South upper deck, the flag raiser (Steve Niehaus this week) walks up a flight of stairs to the roar of the crowd, and then raises the flag on a new, higher platform. The 12 flag is also now about three times the size as the original flag. It looks absolutely amazing… Thanks to the lightning and rain storm, it took us two hours to get from Gas Works Park to downtown Seattle. Had to cut the pregame short but still had a great time at King Street Bar and Oven regardless. A $3 tallboy of Rainier is a great deal… I pulled a great prank on the guys in front of me. They had left the NFC Championship Game early back in January so I taped signs that read “I left the NFC Championship Game early” on their seat backs. Got a good number of laughs from random people walking up the aisle so that made me happy… Ladies here’s a warning for you. Do not play with your hair all game long or else we will make a drinking game out of it… Good to be back in the building after a 7 month break. Football is officially back! Check back on Thursday as I preview preseason game number 2 against the Kansas City Chiefs. Thanks for reading and go Hawks!